Late night munchies are all too real. We’ve all had those moments of working late, and craving biryani or even getting home dog tired and wanting something as simple as a tub of ice cream. Then there is also the weekend when all you want to do is to get lost in a movie or a Netflix binge session and realise that it’s far too late to get food from anywhere. But the great thing about Chennai is that there are a lot of places in the city that offer midnight delivery that’s just a call or click away… And the food arrives steaming hot at your doorstep in less than an hour. And for those of you living in OMR, we’ve got the lowdown on five late night restaurants to cure your cravings. Everyone who likes burgers has either been here or ordered from here at some point in their lives. As the name suggests, they have delicious juicy vegetarian and non-vegetarian burgers to choose from. The names are the best part too, we’d definitely recommend the Whoo Ahaa which has chicken marinated in spicy chilli and garlic, topped with cheese and a fried egg. Or you can even enjoy a burger from the CJB Special Burger section including The Boss, which is spicy minced chicken burger, shredded chicken, a special tandoori sauce and topped with a fried egg. The specialty of a lot of takeaway places is to have different cuisines available to their customers, and Moonlight has it all. Pick and choose from different Chinese and Indian dishes, to settle for a big bowl of biryani or even hand-held rolls that you can devour on your couch without a hitch. Best known for their biryanis, Rasavid is a multicuisine restaurant that works till midnight and does home delivery as well as run a buffet that you can enjoy. Choose from Andhra starters like Chicken Vepudu, Hyderabadi Paneer 65 or sample some Chinese starters including the Schezwan Fish or a Shanghai Roll before you order Indian dishes to pair with naan or paratha. 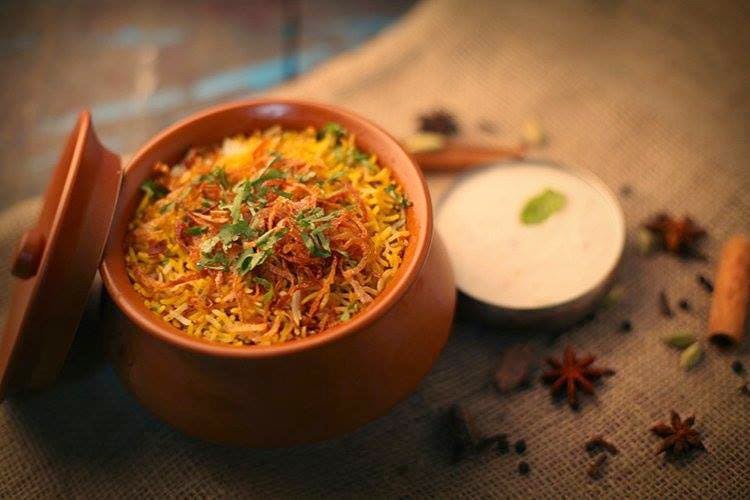 And if you’re a biryani fan, that might be all you really need to get through the evening. Ice cream cravings late at night? Been there, done that. Cream Stone in Thuraipakkam does home delivery, so select the flavours you want, mix it all up and they’ll bring it over. Just note that if you stay a little too far away, there’s a good chance your ice cream would melt and become mush. Unless you don’t mind slurping it all down? All the burgers you can enjoy, right here in one place. And even better is that their burgers aren’t too expensive and they’re open really late into the night, so no matter what time your cravings strike, this is where you can call to get what you’re looking for. If burgers are not your thing, try their sandwiches or their beef cutlets or even pizzas! We’d suggest you try the Twinkle (Double Patty with cheese and fried eggs and a side of fries) or the Veg Merger (Paneer, mushroom with cheese and veggies).